Jan.11 (NBD) -- Xu Liuping, Chairman of FAW Group Corporation (FAW Group), released the all-new brand strategy for the company's luxury car marque Hongqi at a press conference held at the Great Hall of the People in Beijing Monday. The company aims to reshape its brand image and to sell 100,000 cars by 2020, 200,000 by 2025 and 500,000 by 2035. 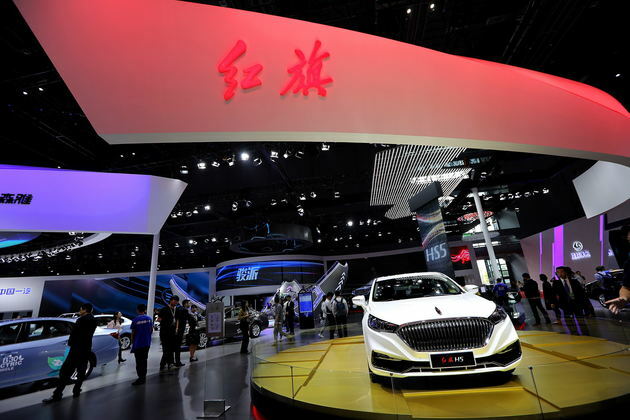 Unlike the company's former Chairman Xu Jianyi, who positioned Hongqi as a model for high-ranking government officials, Xu Liuping hopes to make the nameplate more accessible to common people. Hongqi's new brand strategy has been long in the making. FAW Group set up a separate service unit for Hongqi in March 2016, a same-level entity as FAW Car Co,. Ltd. in the FAW Group family. After Xu was named Chairman of FAW Group, he aims to build Hongqi the most luxury car brand in China. Besides, Xu oversees the unit himself. The press conference ushered in a new development era for Hongqi. According to the plan revealed at the conference, Hongqi aims to fulfill its target sales for different stages during the period 2020-2035 by applying new designs, intelligent network, and new energy technologies to its new models. Xu noted at the conference that FAW Group is to release 17 Hongqi models by 2025. In the future, the lineup of Hongqi is expected to entail four series: L, S, H and Q. L represents high-end series, S sports cars, H mainstream passenger cars and Q business cars. However, it only has two models so far, namely, the H7 and L5. As the L5 is specially designed for government officials, the H7 is the only passenger car that the marque offers to the public. NBD noticed that the annual sales of the L7 have never surpassed 10,000 units since its launch in 2013. Statistics show that the annual sales of Hongqi were about 5,000 units in 2015 and 2016, respectively, and the sales figure for the first 11 months of 2017 stood at 4,004 units. Apparently, it would be a little bit challenging for Hongqi to increase its annual sales from 5000 to 100,000 units within 3 years. As the first self-developed car in China, Hongqi is well-known for the public, yet hasn't truly entered common people's lives. Gu Huanyu, brand analyst of the Ministry of Commerce of China, said transforming from "know Hongqi" to "buy Hongqi" is vital for the company's rejuvenation. Unlike other domestic car brands like Geely and Great Wall, Hongqi is a high-end brand of FAW Group. As a result, people have higher expectations for it. Like every other predecessors, Xu Liuping considers reviving Hongqi as an import KPI for his job. After the press conference was over Monday, he posted on its Wechat account "I would do everything I can do to revive Hongqi". When it comes to R&D, he set up research centers in five cities of three different countries. Among those cities, Changchun is home to the nameplate's global headquarters with three research institutes concerning design, new energy and intelligent network technologies. The Beijing-based research institute is studying experience perception. In addition, Hongqi has expanded its R&D presence to Shanghai, Munich, and Silicon Valley. According to the plan, Hongqi is scheduled to release its first electric vehicle in 2018. In 2019, it will put its fuel cell car into field operation and mass produce L3 autonomous vehicles. By 2020, it will produce cars with a range of 600 km and release L4 autonomous vehicles. By 2025, it will release 15 electric car models, and release L5 autonomous vehicles. With the introduction of new management and technology expertise, it's possible to revive Hongqi. However, it is still a long way to go before the marquee can win the market.